See The Children of Men with GadgetVicar Boy and pal. Do weekly shop for swarm of locusts that live in the rectory. Watch, Tinker, Tailor, Soldier, Spy on DVD. To Meet, or to Discipline Desire? Consumers demand options, but this poses a problem. Formation into the likeness of Christ is not accomplished by always getting what we want. In ages past, choice was not heralded as a Christian's right. In fact, relinquishing our choices by submitting to a spiritual mentor or community was prerequisite to growth in Christ. Believers were guided through formative and corrective disciplines—most being activities we would never choose if left to our desires. But surrendering control ensured we received what we needed to mature in Christ, not simply what we wanted. In consumer Christianity, however, church leaders function as religious baristas, supplying spiritual goods for people to choose from based on their preferences. Our concern becomes not whether people are growing, but whether they are satisfied. An unhappy member, like an unhappy customer, will find satisfaction elsewhere. As one pastor enthusiastically said, "The problem with blended services is that half the people are happy half the time. With a video venue, you can say, 'If you don't like this service style, try another one!'" Ironically, this demand for choice that has fueled the consumer church may ultimately be its undoing. According to George Barna's book, Revolution, 20 million Americans are no longer satisfied with the options available at institutional churches. Instead they're "choosing from a proliferation of options, weaving together a set of favored alternatives into a unique tapestry that constitutes the personal 'church' of the individual." It's the logical conclusion of consumer Christianity: iChurch. The new breed of Christian consumers, Barna's "revolutionaries," customize discipleship the way iPod users customize a playlist. They might find encouragement at a community support group, worship at a Third Day concert, listen to a podcast sermon, and read about the topic of the day at the Christian bookstore. While the church as we've known it fades into memory like vinyl LPs. Read the whole of this article from Christianity Today here. Read the whole article, then ask yourself, "If this is true for American Christianity, is it also true for Christianity in the UK? If it is, is my faith consumer-based?". I am ashamed and angry. Ashamed that our immigration policy is so tight. Angry that one of our families received letters yesterday from the Home Office yesterday telling them they must leave the country. They have ten days to appeal. I know I am biased, but these folk are part of us. I know too that their story is but one of thousands of similar stories. But it just doesn't seem right, just or hospitable. This family has been part of our church family since 1998. They receive no social security, so aren't sponging off of the state. The fifteen year old daughter is a straight A's student in her 'Highers' year at school. Her Glaswegian accent is impeccable. When I arrived at their home at 6pm this evening, she had just been told the news. Tears flowed. We talked and prayed and hugged. I imagine that no one will sleep tonight. This country was built on immigration and exploitation. Think of the Saxons, the Vikings, the Normans, Jewish emigres from Central Europe in the 19th century, the men and women who came from the Caribbean in the fifties and sixties, and many more. We exploited many of the countries that immigrants now come from. Hospitality to strangers is a distinctive of Christian faith. Then again, the UK stopped being a Christian nation a long time ago. Tonight, another Glasgow Church faces a similar situation. I'm with Father Gerry at St Patrick's in the struggle. Tomorrow we'll need to seek advice on how to proceed. Watch this space and please, please pray for this family. What a cool Archbishop! He is passionate, funny, Jesus-centred and humble. A wonderfully encouraging hour in which the Lord drew near to me in a lovely way. Mind you, when he was asked about the Anglican Communion, I got the distinct impression that the Global South meeting in Kigali, Rwanda this week, could well come up with some interesting news. 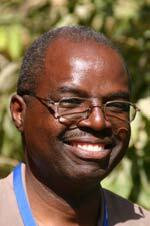 I'm off to hear Henry Luke Orombi, Archbishop of Uganda, at lunchtime today. He is speaking on behalf of Africa Inland Mission on a whistlestop tour around Scotland. He's here tonight. He's a lively one, for sure, and a powerful godly leader, by all accounts. My friends in Alabama are now under his oversight, and they told me that when he first visited their vestry last year, he went to each member, prayed for them individually, and offered an encouraging word to each one. This is not something that leaders here are partial to doing. Archbishop Orombi is also one of the Global South leaders who is most concerned about where the provinces in North America and Europe are moving in terms of doctrine. Today, however, he'll be focussing on mission and development work, rather than the internal disputes of the Anglican Communion. I've started to read Steve Chalke's and Anthony Watkis' 'Intelligent Church'. It is a good read, and one that I'm finding simultaneously encouraging, affirming and challenging. They are trying to help the Church engage with the world in a post-Christendom environment. Grace, love, and diversity feature heavily but there is also a rootedness in Jesus and scripture. It will mean a certain messiness but also an attractiveness; many churches today can't handle the former and are sadly lacking the latter. I think this is what the Lord has called us to experiment with at St Silas'; how to be an ancient/future community of God's people that looks to the past, is open to the present, and anticipates the future. It's a heady mix. I do wonder if the writers will find themselves preaching to the converted. The practical ideas included in the book are helpful, but I'm not sure how many conventional churches could or would take them on board. 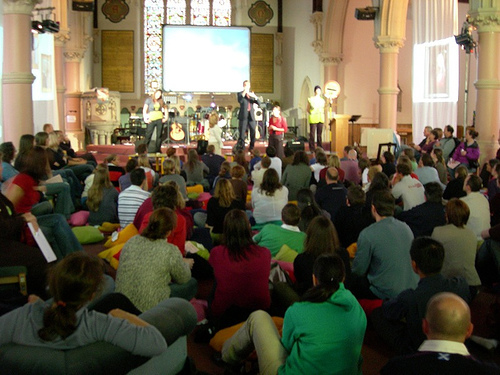 It seems likely that what we are seeing happening, certainly in the UK, is small communities of people, in different streams, discovering new ways of doing church that work in their environment. Fresh Expressions is an attempt to encourage this too. A word to the wise: if you have any influence in a church, let those who want to experiment a bit, do so. They might just be riding the wave of discovering how to be an 'Intelligent Church'. Grayza has details of last night's 'Deeper' service at St Silas', here and here. It was an amazing effort, combining music, art, theatre, the Bible and pre-service refreshments. Yet again, I count it a privilege to work alongside such a gifted group of people.